I recently received an exciting email from Danish brand, Carmakoma asking if I would like to be a Carmakoma Jeans Ambassador - I of course said yes! They have recently launched a sub-label called "Carmakoma Jeans" and they have a select collection of denim items which you can see here. When they asked if I'd like to pick some pieces to try I of course chose the *Kadina Dress and some joggers that I will blog about soon. This dress is going to be my 'go to' dress for the forseable future because it's one of those items you can just grab and put on, fuss free but you still look well turned out and I know i'll be able to style it in a hundred different ways. There's an idea actually! Maybe I should start a feature where I take one item and style it three ways... would that be something you'd be interested in seeing? Size wise, I picked a size "L" and I went a size up from normal as I didn't want the dress to be clingy on my stomach. I was nervous that the dress wouldn't have much stretch in it but it does and I like how it just falls and doesn't feel tight and there's no hint of a VPL anywhere *please see the pic of my behind! I kept the outfit simple with some Nike Roshe Run trainers, thick black tights because Spring is still on vacation and an old white rucksack that I use over and over again. Yes to the one item styled multiple ways! The moto detailing on this dress is awesome! I love this dress, i'm thinking about buying it since its release! 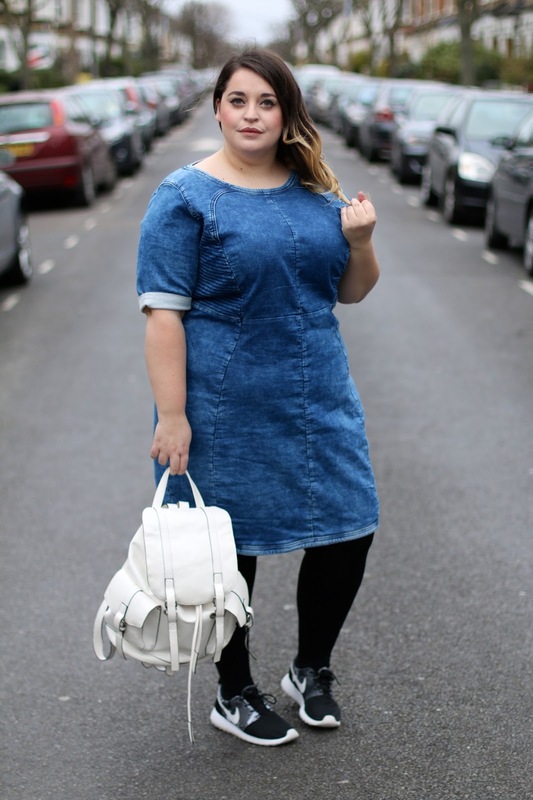 I have wanted a denim dress since forever, but don't have the right proportions to fit dresses properly! 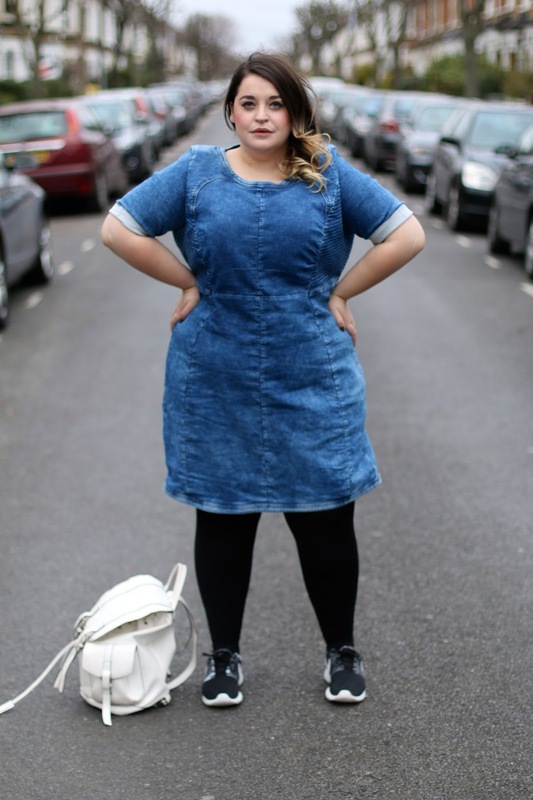 This would be my dream denim dress, it's amazing! You look gorgeous, as ever! The problem is I have a bust and big belly, but no bum and hips so always look very unbalanced! fab outfit post! Would love one piece three ways! You always look so good in everything you wear, your makeup is on point. 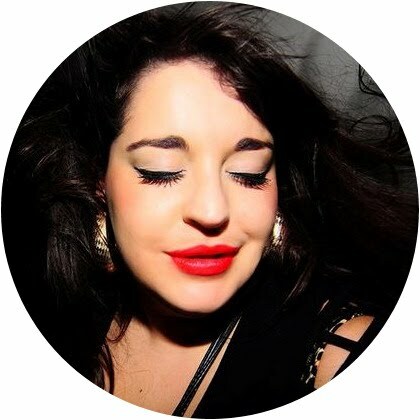 You should definitely do some kind of tutorial on how to do eyeliner for your less talented readers. You probably hear this ALL OF THE TIME... but you're just so gorgeous. And I don't usually say that too often to other ladies. So, that's a very sincere compliment to you. All Star Lanes | Holborn, London. 10 plus size frocks perfect for Spring. K is for Khaki + Kim K.
© Danielle Vanier. Powered by Blogger.